Assessment has long been acknowledged as an essential feature in the provision of early childhood special education (ECSE) services, both as a major element of eligibility determination and a required element of intervention planning and ongoing evaluation for children and families. In recent years assessment practices available for young children with disabilities and their families have become more sophisticated and broader in application across a wide range of settings. 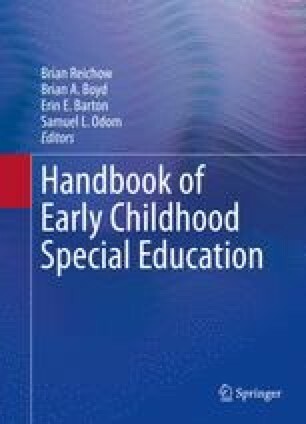 The purpose of this chapter is to provide an overview of this historical role and to highlight features of the emerging uses of assessment as a central feature of high-quality services for infants, toddlers, and preschool children with disabilities, their families, and those who serve them. In particular, this chapter argues for an expanded view of assessment—one where assessment practices, carefully aligned and intertwined with formal and informal services and supports, increase the efficacy and efficiency of societal efforts to promote young children’s development. Given this approach to assessment, we describe basic features of assessment, including its core purpose and functions and the quality standards for its use, and review four major functions of assessment in early intervention and ECSE: eligibility and identification for specialized intervention, program planning, intervention and fidelity assessment, and progress monitoring. Preparation of this manuscript was supported in part by grant R324C080011, the Center for Response to Intervention in Early Childhood, from the Institute of Education Sciences, US Department of Education, to the University of Kansas, Charles Greenwood and Judith Carta, Principal Investigators. However, the opinions and recommendations presented in this paper are those of the authors alone, and this paper does not imply official endorsement from the Institute of Education Sciences. Dr. McConnell and his colleagues have developed assessment tools and related resources known as Individual Growth & Development Indicators and Get it, Got it, Go! This intellectual property is subject of technology commercialization and possible licensing agreements through the University of Minnesota. Dr. McConnell may be entitled to royalties for products related to the research described in this paper. The university has reviewed and managed this relationship in accordance with its conflict of interest policies. Division for Early Childhood. (2014). DEC recommended practices in early intervention/early childhood special education. Retrieved from http://www.dec-sped.org. Good, R. H., & Kaminski, R. (2000). Dynamic indicators of basic early literacy skills (DIBELS). Retrieved from http://dibels.uoregon.edu. McWilliam, R. A. (2003). RBI report form. Center for Child Development, Vanderbilt University Medical Center, Nashville, TN. Retrieved from http://www.siskin.org/www/docs/112.190. National Academy for State Health Policy. (2014). ABCD resource center. Retrieved October 3, 2014, from http://www.nashp.org/abcd-welcome. National Governors Association Center for Best Practices, & Council of Chief State School Officers. (2010). Common core state standards. Retrieved from http://www.corestandards.org/. U.S. Department of Health and Human Services, Administration for Children and Families, & Office of Head Start. (2011). The Head Start child development and early learning framework: Promoting positive outcomes in early childhood programs serving children 3–5 years old. Retrieved from http://eclkc.ohs.acf.hhs.gov/hslc/hs/sr/approach/cdelf.